The Regal Penthouse Two-bedroom condo has unquestionably the MOST spectacular panoramic ocean views of the world-famous Eagle Beach! 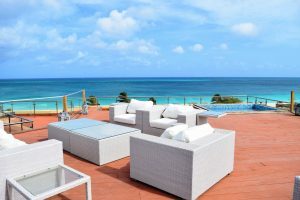 Featuring a spacious elevated rooftop deck terrace with a private mini pool, a outdoor kitchen counter with built-in full-size BBQ-grill, an outdoor refrigerator and ice-maker, 6-seat patio dining table, seating and lounging area! Great to enjoying Aruba’s beautiful sunsets and outdoor lifestyle. 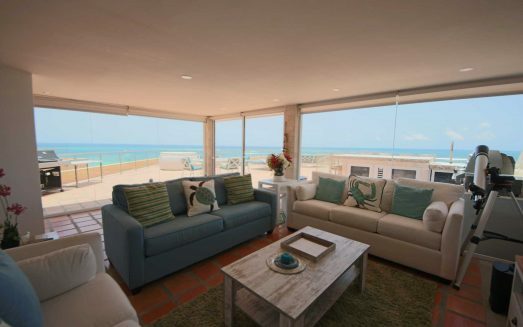 This beachfront condo has a master bedroom with king-size bed, a built-in kitchenette that can be closed off, full modern en-suite bathroom and a balcony with great ocean views and 6-seat dining table. The second bedroom with two twin-size beds, built-in closet and second full modern en-suite bathroom. Furthermore, there are two twin-size pull out beds with extra pillows and linens to increase the sleeping capacity for your extra guests. Cable TV, two high-definition flat-screen TV’s (in each bedroom), an internal spiral staircase that lends access to rooftop, free broadband wired and wireless internet, and laundry facilities (washer/dryer) are all available for your comfort. This unit is located in the Boca Catalina building on the third floor, with no floors (other than its own roof terrace) above it.—Sleeps max 4+2. 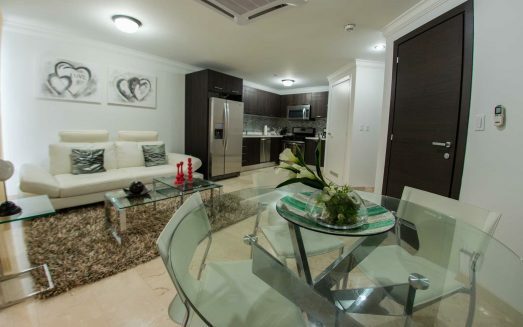 NOTE: This two-bedroom unit is part of a larger unit; each sections of this large condo have a separate entry door. The owner keeps the other section for his private use only, a few weeks per year and preferably when the rentable section is not occupied, to honor the privacy of his guests. If the owner is inevitably present in his section during a guest’s stay, the owner ensures that (a) the rooftop terrace and joint laundry facilities remains for private use by guests only and (b) a 20% discount on the total rate is granted to the guest! 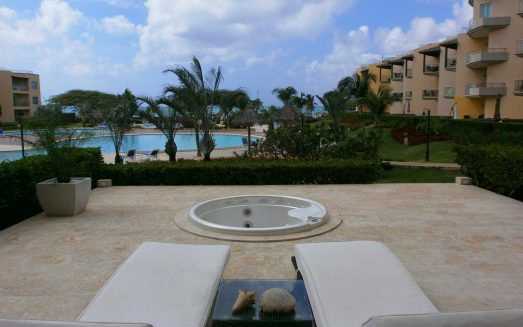 The resort facilities include three large swimming pools, a kiddy pool, a gym, men’s and women’s sauna, a business center, a kids playroom, two tennis courts, a game room, a racquetball court and squash court. Wonderful landscaping of the premises. The Eagle Beach is just a few steps outside the premises; a white-sandy, 50-yard wide, amazingly uncrowded beach with sparkling clean ocean water. 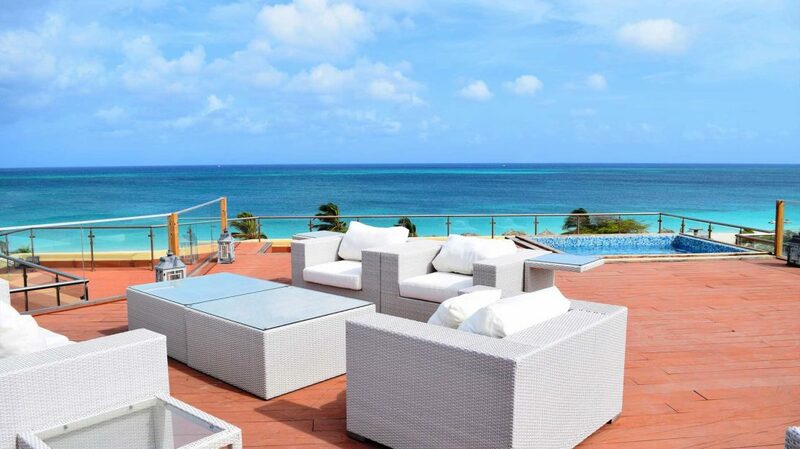 Enjoy the tranquility of the resort, stroll on the beautiful beach or swim in the tranquil Caribbean sea!